EPISODE SEVENTEEN, SEASON THREE- "THE TEAM"
Oh, "Agents of S.H.I.E.L.D." you try my patience. I was pretty steamed when the show decided to dump Mockingbird and Lance Hunter. Sure, they are getting their spin-off show, but just because you can do something, doesn't mean you should. 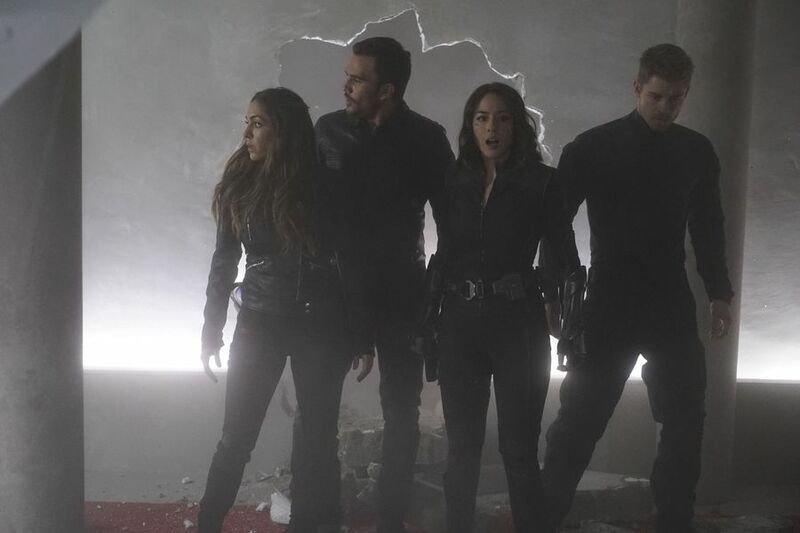 It was whimsical luck that "Agents of S.H.I.E.L.D." got a second season. They chose to really revamp the show, which gave us a third season. Part of that revamping was introducing a host of cool new characters. Which added to the flavor of success. Now, not even a whole season after the introduction of Mockingbird and Lance you take them off the show. After spending a whole summer playing with the idea of taking them off then not? That just seems sloppy and silly. Tonight, they turned Daisy Johnson into a villain. Oh sure, she's under the control of Hive. But its pretty clear in the stinger for the upcoming four episodes that she will be standing arm-in-arm with Hive. There is also a possible death for her on the horizon. By the end of this episode, I had to make sure I was watching "Agents of S.H.I.E.L.D." and not "Game of Thrones." Just because one show in existence can kill off its entire cast of main characters, doesn't mean every show has that luxury. I mean, just look at the quality drop in Showtime's "Homeland" once they killed off Brody. I loved the early part of the episode, when Daisy recruited Yo-Yo, Joey and Lincoln to go save Coulson and the rest of her team. Leading to a pretty awesome rescue mission. The rest of the episode was based around the team trying to figure out who Hive infected. Part of his power base allows Hive to infect other Inhumans with a mind control agent. Of course, its Daisy who gets it and she is now under the influence of Hive. Can I please ask why? What's the point of doing the whole S.H.I.E.L.D. agent turns bad storyline again? When they did it in season one, off the heals of "Captain America: Winter Solider" that was a shock. That was rousing storytelling. But in season two they had another inside man storyline that ended up half-assed. I know that this is a show about a spy agency, but that doesn't mean you can keep recycling the same plots over and over again. You can still make a compelling and entertaining spy show without doing the same thing each season. This is Marvel for crying out loud. Yet, for some reason, the show hardly acknowledges that. They've been teasing The Secret Warriors all season. Then after one bad mission, they disband? Is that really supposed to be good storytelling? Compelling storytelling? The Secret Warriors would be an awesome way to keep the show going, but they apparently want nothing to do with it. The show also likes killing off Marvel characters for no good reason. I wouldn't care as much if they gave us some break out original characters. Besides May, Fritz and Jemma, that hasn't happened. There was a lot about tonight's episode that left me cold. I think this show might be getting a little too ahead of itself. Or its aware of its ratings problem and is now trying to pull out all the stops. That's never a good sign. What gave you the green light for a third season in the first place was the rich storytelling of the second season. Stick to that, rich storytelling. Then maybe people will keep tuning in. Doing the same thing over and over while getting rid of great characters and equally great potential storylines? Not such a good plan.